After a wonderfully relaxing time at Holland's seaside (click here), we were looking forward to a few days in Amsterdam to explore Dutch city life. Again we were so impressed by how friendly, warm and welcoming everyone is (and speaking perfect English, too). Amsterdam's picturesque canals are flanked by beautiful narrow buildings, constructed by merchants who became wealthy in the 17th century, Amsterdam's Golden Age. Holland's trade, military art and science was on top of the world, and brought enormous wealth to the city. Most people cross town on bicycles... the young, the old, and everyone in between. Bikes outnumber cars by far, and it has the wonderful side effect of greatly reducing engine noise and pollution, which contributes so much to the laid-back atmosphere of this pretty city. 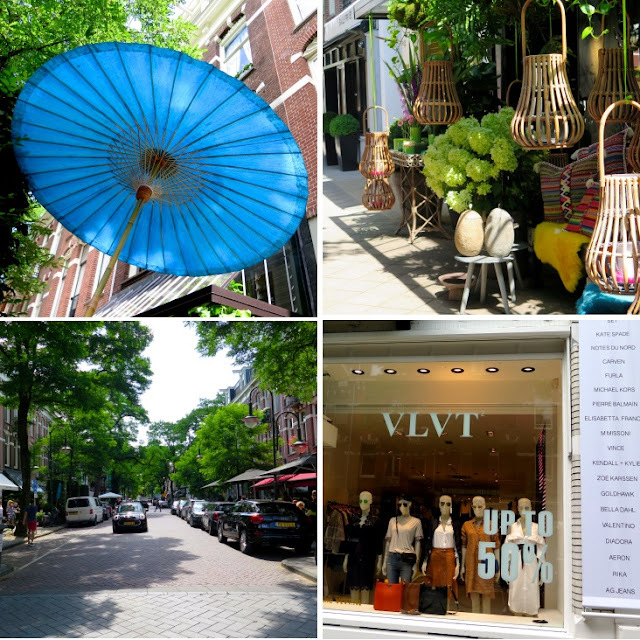 The 'De Negen Straatjes' (Nine Streets) is located in the heart of the historic canal district and is a lovely neighbourhood to explore: Nine picturesque streets span three blocks and canals and are lined with shops, cafes, art galleries and restaurants. We stayed at the chic and stylish Dylan hotel, located on the Keizersgraacht in the heart of the Negen Straatjes. The rooms and suites are beautifully decorated, making you feel at home away from home. It also has a cool bar (Occo), romantic inner courtyard and a Michelin starred restaurant (Vinkeles) under its roof. 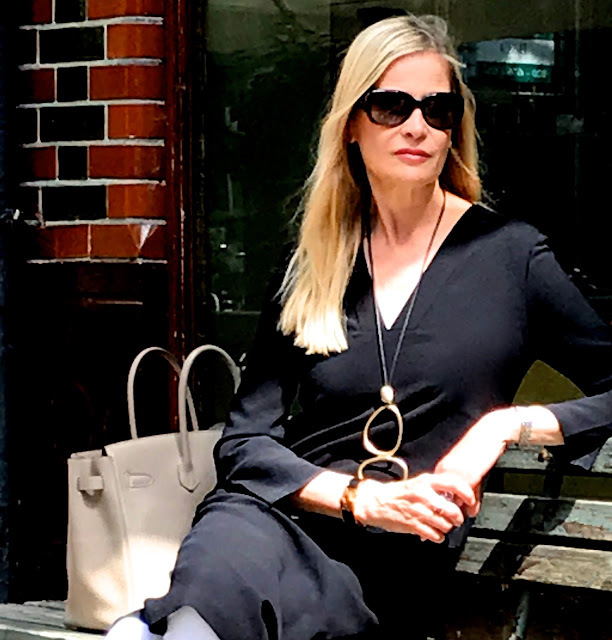 On our first day I found this tunic dress by Scandinavian designer Filippa K (available here) in the Nine Streets and it became an instant favorite. 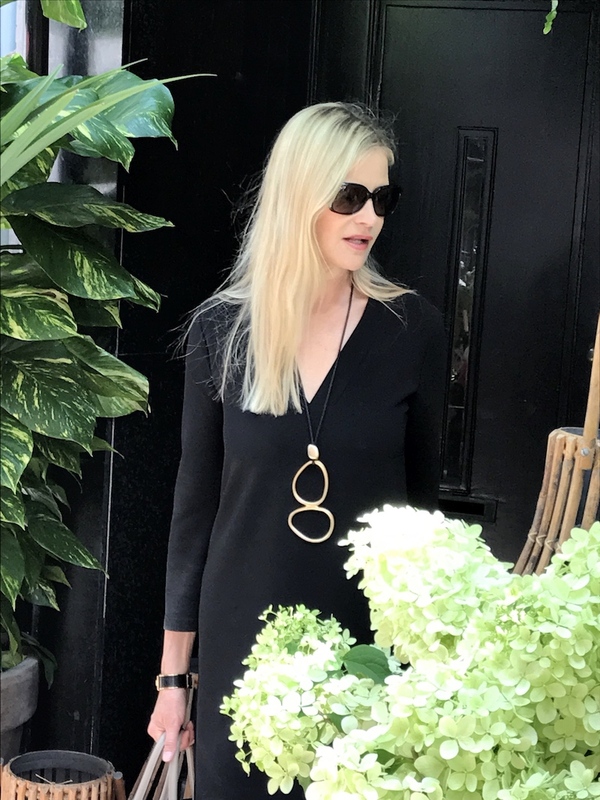 You can dress it up or down with a simple change of accessories (here with a MaiTai Collection Double Anneau necklace in noir/or, available here), which makes it a perfect travel companion. Teamed with trousers and boots it will be great for the coming winter and autumn months too. And then.. apparently no problem for a family of three! 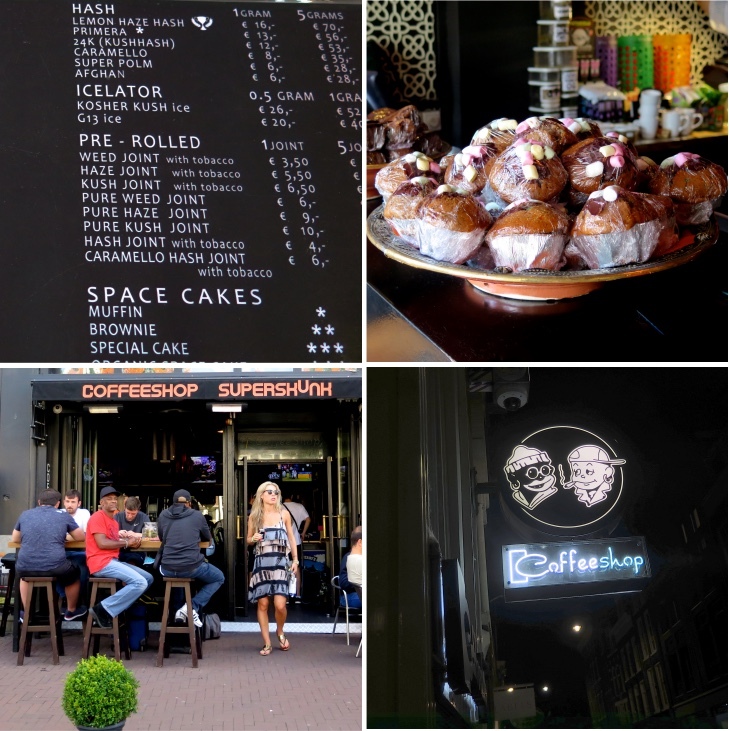 The Cornelis Schuytstraat is another great area for shopping, and you also come across plenty of lovely little restaurants and cafés. Holland's most famous exports are flowers, and at the Menno Kroon Concept Store you see a very lovely and beautiful selection. In keeping with the general laid back atmosphere, many boutiques have benches where you (and your tired shopping companions) can have a rest.. If after a day's walking you find yourself thinking of a coffee or a little something, be careful not to pick up a muffin from the counter of a 'coffeshop'... unless you'd like to 'alter your state of mind' that is. What may look like an ordinary muffin could in fact be a space cake, infused with hash or weed, whatever the preference. Other items on the menu include a variety of pre-rolled joints, hash by the gram, as well as regular coffees and soft drinks. Ordinary cafés are called 'coffee houses', so be sure to enter the right kind! My new dress, worn tunic style with a white pair of jeans. Dating back to 1683.. 'It really does not matter' What a great motto. Missed the Wiener Boys (click here to see their IG page) of course, and found myself stalking dachshunds.. this one had a leash matching his owner's dress! 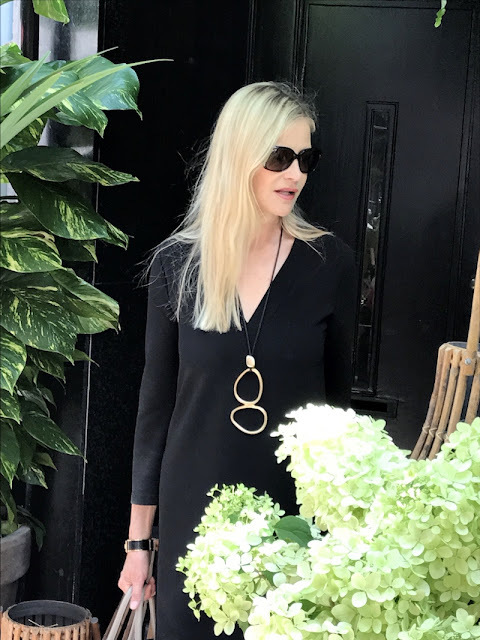 For an evening out, wearing the tunic dress by Maje I bought last year (click here to see the blog post), accessorised with a Kelly Pochette in black croc, MaiTai Collection Double Anneau necklace, Charniere bracelet in black lizard/rosé gold and Dior (Frisson2) sunglasses. All wines, cheeses and spirits served at the Rijks have a Dutch connection.. if not actually produced in Holland, then wine makers, distillers or cheese makers of Dutch origin. The chic modern interior. The evening was so lovely and mild that everyone was dining on the terrace instead. The Côtes de Provence Fleur de l'Amaurigue rosé (by Dutch de Groot winemaker family) was excellent and reminded us of home. Cheese from Holland, of course! 2. The Duchess - A fantastic venue (it used to be a bank) and a fun menu.. all courses are meant to be shared, so you end up with plenty of different dishes. Most of the former KSK bank's features are still intact.. the ornamented ceiling, marbled counters, and huge stand-alone clock are in striking contrast to the ultra modern screens and the open kitchen. 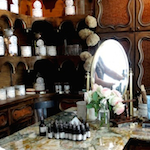 It's a fabulous mix, lit by huge chandeliers and candle lights. 3. Right across the street from the Duchess you find the W lounge bar with and Mr Porter restaurant. 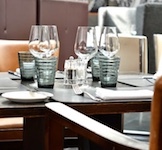 If you book at the restaurant, it is well worth getting there a bit early and having a drink in the bar... it offers stunning panoramic surround views of Amsterdam. Mr Porter is Amsterdam's most famous steakhouse with a staggering choice of carefully selected meats and cuts, but it offers beautiful vegetarian dishes too. P.C. Hoofstraat: Amsterdam's high end shopping street, where you find Hermes and many other luxury brands. It is a lovely and relaxing street, making shopping extra pleasureable! Menno Kroon Concept Store: Cornelis Schuytstraat 11, 1071 JC Amsterdam. Thank you for this lovely travelogue. My husband and I visited Amsterdam last December and enjoyed a wonderful meal at The Duchess. I had no idea Amsterdam would be so interesting - guess I've been living under a log - a very soggy log at this point! Everything looks so enticing and colorful after the cool, monochromatic beach stay. I would die in one of those tiny cars, though. I'd be afraid that once I somehow managed to fold myself into it, I'd never be able to unfold myself and get out of it! They're certainly great for the environment but probably not meant for slightly claustrophobic Swans. I do want to know why you were kissing that young man in the third picture, though, in your new black dress. Scandal! Had you been indulging at one of those infamous coffeshops? And, as far as offering to chop some onions, I'd be all in for that task - those chefs are too cute! I'm glad that you had such a great time in Amsterdam and thank you for sharing. Your photos are, as always, superb. Ah ah ah I would be curious to know who this young man is too! Much more interesting than the little tiny car! Awwww, thank you dear K. I'm finding humor very necessary during these trying times (but Irma did not get me!). And, really, don't you want to know what the lovely MT was doing kissing that boy? I do! Apparently, I have eaten too many space cakes in the coffee shop because I didn't even notice the photo of the lovely blonde woman making kissy faces with the handsome young man. You girls have some eagle eyes! What caught my attention, in addition to the boats, was that darling little car! It looks just like a toy! What safety features do you suppose it has? I'm not sure it would provide much protection in a crash. When car shopping, I wanted a Fiat. A cute, sporty, little red Fiat. My sweet husband took one look and I saw my dream of a fun Italian ride squirt out the window. Now I drive a fabulous Subaru Outback, that I love, but it is by no stretch of the imagination sporty. I digress. I hope Jerrine and the East Coast swans have upped their storm preparations. There are so many now that I've lost track, but another storm headed your way is surely insult after injury. Fill the bathtub and buy your plywood, and most importantly, put the Hermes scarves in a big Ziploc bag for protection! Here's hoping it's not so bad and that we all come out sighing with relief. Yes, dearest C. Men are always more enticing than machines, aren't they! Thank you for sharing so many great pictures of Amsterdam, a city I very much like. The houses along the cannals are so well preserved and so beautiful! You look fabulous as always! Any temptation at Hermès at P.C. Hoofstraat? What a beautiful oasis of calm these travelogues have been during these horrific times in Houston. I have enjoyed returning again and again to get lost amongst the beauty! I can only echo other Swans' comments about seeing familiar places through your eyes. It is truly like experiencing the best, most moving moments of beauty and re-living them. Amsterdam is one of my favourite places to visit, and I thought I know it quite well, but thanks to your amazingly edited travelogue I long to visit the city and the places you feature again. 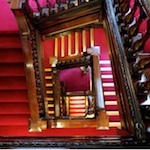 Many, many thank for taking time to share your impressions through your blog. Have most enjoyable last days of summer. Hello, dear MT and lovely Swans! I feel bad neglecting the blog and the fun conversations that take place here, but I've enjoyed every travelogue just the same. I am madly downsizing and packing because . . . I'm buying my own home (condo)! Without a husband or anything! Just me! I'll be house-poor but happy to be in a place of my own where they can't raise the rent by ridiculous amounts. To be starting over like this at 64 is insane -- but perhaps sanity is overrated. After the move I'll post exciting pictures on Instagram of rooms filled with unpacked boxes. Hope the weather is improving for those who suffered through a sweltering summer. Well done Fifi, many, many congratulations!! What a great step to take and I look forward to seeing pictures on IG. Can't believe you are 64, but it's seems the perfect time to get into your own place! Wishing you the best of luck for the move!! What a lovely new! I am so happy you will have your own sweet home. All by yourself 😉Women power! I wish you much happiness. Thank you, dear Catherine! I'm very excited about it. I will bore everyone with lots of pictures on Instagram.